Shooting Earmolds - Shot Plugs custom made to fit your ears. 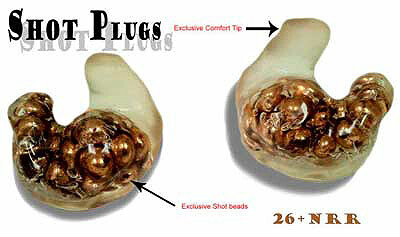 Shot plugs are made of the highest quality medical grade materials. They have a 26+ NRR average attenuation of 38+ dB and the high mass design is for increased impulse and low-frequency noise attenuation. We take an impression of the users ear canals so that these ear molds are made to fit optimally in the ear canals so that no sound passes around the shooting protection molds. Options are available: soft or hard material, colors, logos and retention cords. $85.00 a pair, single color.